At least 49 people are reported to have been killed in an alleged chemical weapons attack on the rebel-held Syrian city of Douma. BEIRUT • A suspected chemical attack in Syria's eastern Ghouta sparked international outrage yesterday, as state media reported that the last rebel holdout in the onetime opposition stronghold had agreed to evacuate. Rescue workers said dozens of civilians had been killed in a chlorine gas attack on Douma - claims denied by President Bashar al-Assad's regime and its ally Russia. A joint statement by the medical relief organisation Syrian American Medical Society (Sams) and the civil defence service, which operates in rebel-held areas, said 49 people had died in the attack late last Saturday in the town of Douma. Others put the toll even higher. Douma is in the eastern Ghouta region near Damascus. Mr Assad has won back control of nearly all of eastern Ghouta in a Russian-backed military campaign that began in February, leaving just Douma in rebel hands. United States President Donald Trump yesterday said there would be a "big price to pay" after the "mindless" attack. Mr Trump also called President Assad an "animal", writing in a series of tweets: "President Putin, Russia and Iran are responsible for backing Animal Assad. Big price to pay." United Nations chief Antonio Guterres said yesterday he was "particularly alarmed" by the allegations. The US State Department said that Mr Assad's government and its international backers "must be held accountable". "These reports, if confirmed, are horrifying and demand an immediate response by the international community," spokesman Heather Nauert said in a statement. In London, the foreign office called for an urgent investigation, saying that such an attack would be "further proof of Assad's brutality against innocent civilians, and his backers' callous disregard for international norms". Pope Francis yesterday joined Washington and London in condemning the attack, which according to rescuers left victims struggling to breathe, foaming at the mouth and with corneal burns. "Nothing, nothing can justify the use of such devices of extermination against defenceless people and populations," the Pope said. Turkey said it strongly condemned the alleged attack. Syrian state media and the regime's ally Russia denounced claims of chemical use as "fabrications". 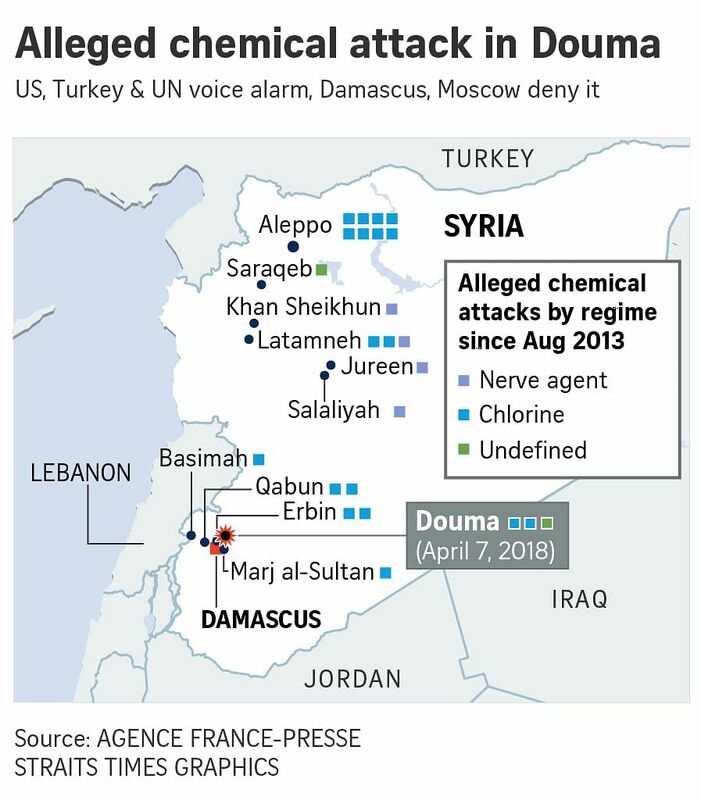 Sams said a chlorine bomb hit Douma hospital, killing six people, and a second attack with "mixed agents", including nerve agents, had hit a nearby building. Dr Basel Termanini, the US-based vice-president of Sams, which operates medical facilities and supports medics in Syria, told Reuters that 35 people had been killed at a nearby apartment building, most of them women and children. The joint statement from Sams and the civil defence service said medical centres had taken in more than 500 people suffering breathing difficulties, frothing from the mouth and smelling of chlorine. The Syrian Observatory for Human Rights said 11 people had died of suffocation, but could not say if chemical weapons had been used. Meanwhile, the state news agency Sana yesterday cited a government source as saying that fighters with the Jaish al-Islam rebel faction had agreed to leave Douma within 48 hours. In exchange, the group would release hostages it had been holding, the source said.